Thousands of bicyclists are rolling into Hiawatha, the 6th overnight stop on this year’s RAGBRAI route. Organizers of the events in the Linn County town settled on a “Throwback Thursday” theme. Tony Burton, the Treasurer for the Executive Council Committee for RAGBRAI Hiawatha, spoke with KCRG-TV. “Because it’s throwback Thursday we are doing some throwback Thursday games,” Burton explained. “There’ll be a large Connect Four, there’s going to be a life-sized Kerplunk and a large size Jenga.” The musical acts in the city’s Guthridge Park will be playing hits from the 50s, 60, and 70s. The headliner is Dennis DeYoung: The Music of STYX. This is the second time Hiawatha has hosted RAGBRAI since 2004. Today’s ride from Cedar Falls to Hiawatha covers nearly 71 miles. 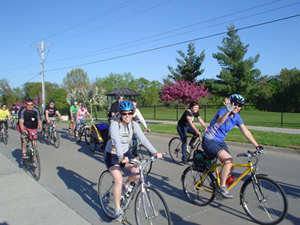 The bicyclists will peddle their way to Coralville on Friday. RAGBRAI ends on Saturday in Davenport.